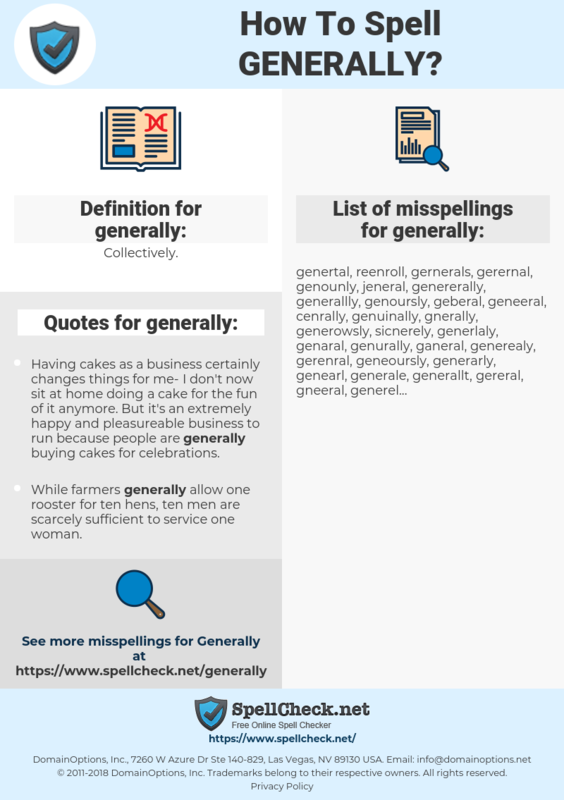 What are the misspellings for generally? What are the common mistypes for generally? 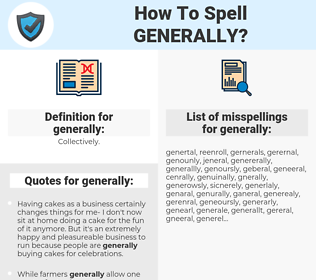 What is the definition of generally? What are the quotes for generally? What are the translations for generally? What are the common typos for generally? This graph shows how "generally" have occurred between 1800 and 2008 in a corpus of English books. Having cakes as a business certainly changes things for me- I don't now sit at home doing a cake for the fun of it anymore. But it's an extremely happy and pleasureable business to run because people are generally buying cakes for celebrations. habituellement, principalement, dans l'ensemble, couramment, ordinairement, normalement, communément, totalement, universellement. allgemein, normal, insgesamt, global, normalerweise, meist, meistens, generell, prinzipiell, zumeist, gemeinhin, allseitig. 総じて, 全体に, 普く, おおづかみ, 遍く, なべて, 一体に, ぜんたいに, がいして, 周く, 大掴み, いっぱんに, 並て, 総別, 並べて, あまねく, たいはん, そうじて, いったいに.